In 2009 in Oklahoma City, Jellybean had been taken from his home by some teenagers, they abused him and then threw him over the fence into someone else´s backyard. 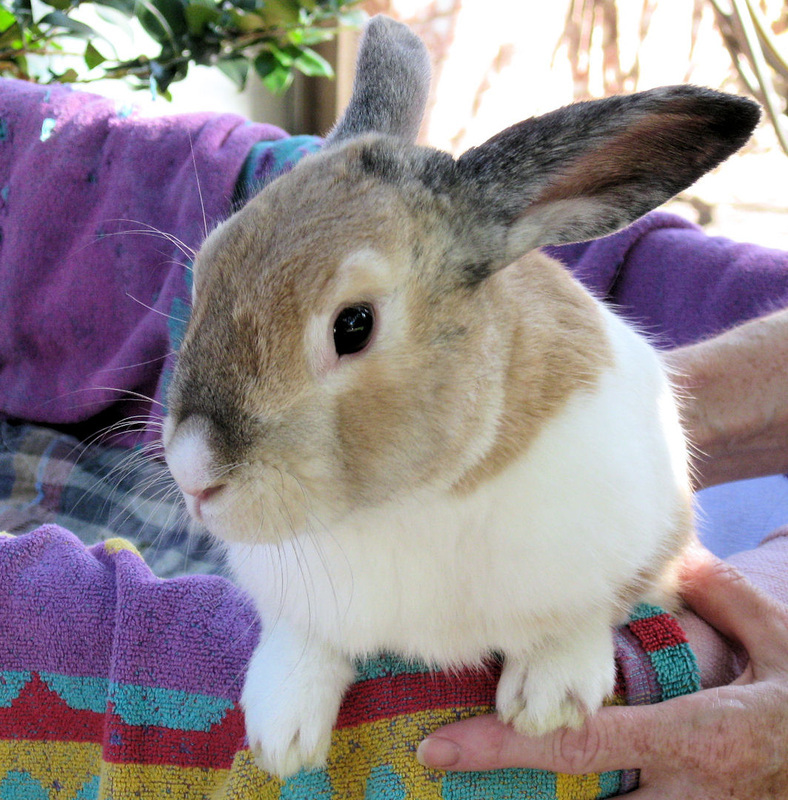 When Jellybean was found, he was taken to Chris who has two house rabbits, from where Jellybean was immediately rushed to a Vet for emergency care. Jellybean had a broken back and some broken ribs. The perpetrators were never found. The original owners were found but they could not take care of a paralyzed rabbit. Jellybean stayed with Chris and was recovering well in his new home with the two other rabbit companions. His back legs remained paralyzed and so he pulled himself along in his new home by his front legs. After some weeks, Jellybean started chewing on his back legs. 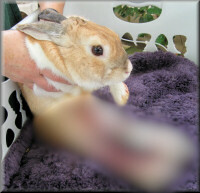 His back legs were bandaged up for his own protection, but he began to tear off the bandages to continue his gnawing. Some people suggested to Chris that Jellybean should be euthanized. Resisting that advice, Chris called Barb Yule of North Texas Rabbit Sanctuary for help. Barb recommended that Jellybean should get to Doctor Effie Giannopoulos of City Vet (Oak Lawn) in Dallas as soon as possible. Two NTRS volunteers drove out to Ardmore in Oklahoma (which is approximately halfway between Dallas and Oklahoma City), to meet Chris and to pick up Jellybean. Jellybean was brought to NTRS in Garland. From there, Marilyn Riha-Kourvelas of NTRS took Jellybean to Doctor Effie in Dallas. Jellybean is alert and has such a sweet trusting nature despite the abuse he had suffered from the teenagers. Chris had given lots of love and attention to Jellybean and so Jellybean did not shy away from the attention given him when he arrived at the NTRS sanctuary. After Jellybean´s veterinary treatment, he will recuperate at the "Haven of Hope". Marilyn heads up the "Haven of Hope" division of NTRS which cares full time for rabbits with special needs. To see more pictures of Jellybean on arrival at NTRS, click on the below thumbnail pictures. Warning: These pictures are disturbing. When Jellybean was examined by the veterinary surgeon, she discovered that one of his leg had started to become septic and turning black. He was at risk of death within days through potential blood poisoning. The best solution was to amputate both of his legs. It was a long operation. Near the end of the procedure, Jellybean stopped breathing. Through quick action, he was quickly resuscitated. Jellybean will eventually be more mobile when he is fully recovered, without the hindrance of dragging along two useless paralyzed back legs. Even so, soon after his surgery he can already pull himself around his basket and pull himself up to the top edge of the basket. He seems relieved that his useless legs are gone. Jellybean is very friendly and sweet. He loves being petted and giving nose bumps. He seems to know that he is being cared for. Jellybean will visit the veterinary surgeon this coming week to see if his staples are ready to be removed. Jellybean will recuperate at the "Haven of Hope." Marilyn heads up the "Haven of Hope" division of NTRS which cares full time for rabbits with special needs. Jellybean´s staples were eventually removed. 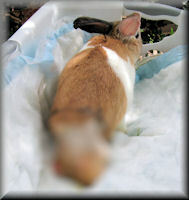 However, Jellybean favored his left hip while resting which started developing an abscess. He returned to the vet where the abscess was treated, some dead skin was removed, all of which resulted in some more stitches. It seems as a result of his broken back, Jellybean still has difficulty controlling his bladder, so Marilyn helps Jellybean express his bladder regularly and always keeps his nether region clean and dry. Jellybean will always need 24/7 care. Jellybean is bright and observant and pulls himself up his open top basket to watch everything that is going on around him. He sleeps in his basket at Marilyn´s bedside at night. Jellybean´s fur will regrow quite naturally. 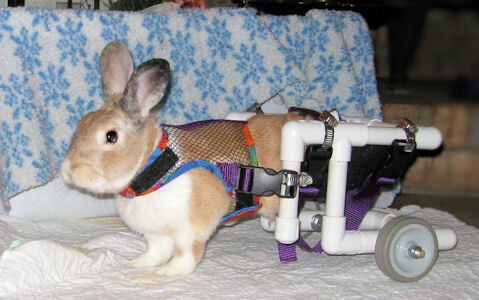 Jellybean´s next major project is to start looking for a harness with wheels for his mobility. To see another picture of Jellybean on arrival at NTRS, click on the below thumbnail picture. Warning: This picture might be disturbing. Jack Holland and The Bunderful Mr. Chew wrote about Jellybeans' story on the Bunnies R Us Yahoo Group. 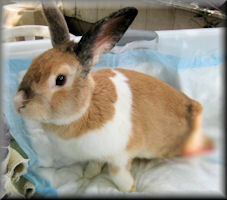 "I learned about Jellybean through Jack and Mr. Chew's posting on the Bunnies R Us list. My husband and I were very touched by Jellybean's story and all he has been through and we'd like to donate a wheelchair for him. I thought the purple one would look especially handsome on him." Carolyn is the "TheHeadBead" of eebeads.com. So on Saturday afternoon at NTRS, Barbara and Marilyn measured Jellybean for the dimensions required by Senior Pet Care Products, Jellybean was amused and was more interested in the fabric measuring tape and the steel measuring tape. "[Jellybean] was really hard to measure... he is so tiny and where his legs would be there is sort of a large flap... hard to describe... it was tough getting a measurement that would be the middle of the hip.... I sure hope they can be adjusted a little if necessary... Jellybean kept grabbing the tape measure and trying to throw it... he is so darn cute..."
Marilyn brought Jellybean to North Texas Rabbit Sanctuary to meet Carol for the first time. Carol from Houston had lovingly helped with Jellybean's medical expenses, and while in Dallas with friends and family, had come to NTRS to visit Jellybean during this Holiday season. Coincidentally, Jellybean's new Critter Wheels from Senior Pet Care Products had arrived, and were waiting for him at NTRS. The Critter Wheels were donated by "TheHeadBead" of eeBeads.com. We were a little worried how Jellybean would take to the harness, because we know some rabbits do stubbornly refuse to accept them. We were planing to introduce the Critter Wheels in easy stages over the coming weeks. Jellybean did initially struggle to accept wearing the harness, but he trusted that Marilyn knew what she was doing, and he quickly adjusted to it. So we went ahead and placed a towel in the frame's hip-sling, and then we placed Jellybean into the frame and clicked on his harness to it. Jellybean just started to walk across the mat! It was amazing, and we all laughed with relief and with delight. We quickly added another mat and watched Jellybean traverse that one too. Then we watched to see if he could go in reverse and make a turn. Jellybean thought about it, and then simply backed up and make the turn around. One smart Rabbit! We then gave Jellybean a short rest while Marilyn cut the towel to size for it to fit nicely in the hip-sling. (The towels are needed because his paralysis has also affected his bladder control). Then Jellybean was placed into his wheels again and he continued exploring. The above picture shows Jellybean standing outside his basket for the first time. His world view for approximately the last twelve months had generally been from inside his basket. Jellybean resides at NTRS's "Haven of Hope." Marilyn heads up this division of NTRS which cares full time for rabbits with special needs. View the video here on YouTube. Jellybean is bonded with the oh-so cute Lily, an adorable black Lionhead rabbit. She is also a double amputee who had her back broken due to a household accident. In these pictures, due to her mane of hair, it is difficult to tell that she had both legs removed. As you can see, she is doing very well and is quite active! NTRS hopes to secure a cart for her as well and donations are always welcome. We hope to have a new video of both bunnies using their carts in the near future. Love is in the air!